Police are seeking John Thornton-Williams, 33, of no fixed address, who is wanted on a warrant issued by Brighton magistrates on Friday 12 August for breaching a community order. Thornton-Williams was jailed twice last year by Brighton magistrates. He was sent to prison for 20 weeks in October for having a knife with a 9in serrated blade in public. He had been jailed for eight weeks in February for a similar offence. In October he was also given a prison sentence for threatening two police officers. He has lived at addresses in Palmeira Avenue, Hove, Vernon Terrace, Brighton, and Lenham Avenue, Saltdean, in the past year and a half, as well as Lewes Prison. 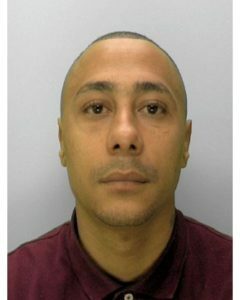 He is described as being of mixed race, 5ft 11in (1m 80cm) tall, with shaved black hair and brown eyes. Anyone seeing Thornton-Williams is asked not to approach him but to dial 999 and ask for police, quoting reference 47160104217. Anyone with information as to his whereabouts is asked to phone Sussex Police on 101, email 101@sussex.pnn.police.uk or call the independent charity Crimestoppers anonymously on 0800 555111.